WHY MUST DOGS BARK?!! And yes, I sure do understand that the sound of a barking dog is anything but pleasant!. 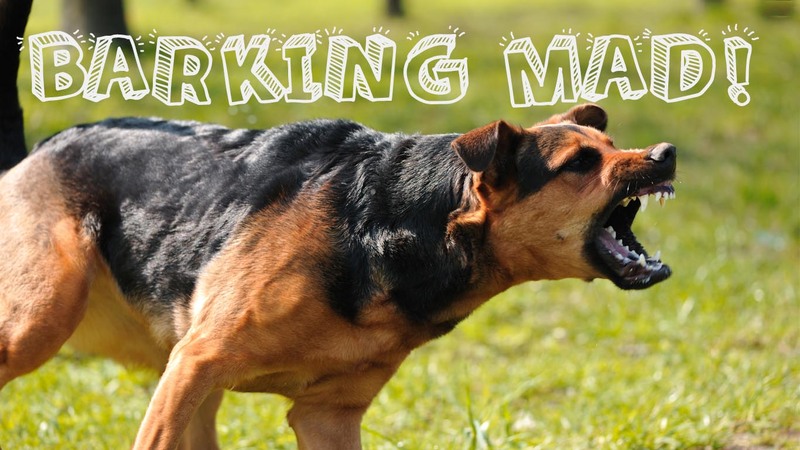 However, there is something we need to keep in mind and that is…..Barking is our best friends way of communicating by alarming us, or his or her “pack” that something just isn’t right. Then there is of coarse behavior problems that incorporate excessive barking that is out of control. Why does my dark need to bark every time he see’s another dog? Why does he bark when I let him outside in the backyard? Why does he bark when someone comes to do the door? My dog’s barking drives me nuts! How do I make him stop!. Every time I leave the house, my dog barks. My puppy won’t stop barking when I put him in his crate…and so on. What we want to do first, is understand WHY your dog is barking in the first place. Instead of getting frustrated at the first sound of a bark, take a moment to analyze what just happened or what’s going on in his environment at that very moment to stimulate him to bark? Is this something you can change or alter ( whatever just happened to lessen the barking )? If it’s something you do not have control over to alter or change then you will need to come with a plan to deal with it , take control over it , lessen it and or if you’re lucky, stop it. Noise or someone at the door – This bark is an alarm bark. Your best friend is doing 2 things here, he’s letting you know someone is at the door and warning the intruder ( in his eyes ). You can’t change your dogs natural instinct to warn and protect, but you can train him to stop , calm or lessen his warning sounds by being consistent in giving a firm command verbally “STOP!” and using a hand signal that you’ve created that means “business” to the dog. ( we have a pointed figure that sternly points to the dog with “I mean business look” and it works!). Make him sit and then when he stops and sits, praise him for a job well done. Like anything else, it takes practice and time and most importantly, it takes consistency from all family members EVERY TIME someone is at the door. Barking at night: Same as above, your pooch is being protective of his pack and his home. Barking when your kids play: Fido is either expressing how excited he is and that he wants to be included, or he’s voicing his opinion that what ever is going on ( like kids rough housing ) must stop – he see’s at as pack fighting. Using your firm “STOP!” AND The Warning Finger with a Sit command to make him stop. Once he does, even for a second, you should reward the behavior for stopping ( as he stopped not when he starts barking again ). Be consistent during this training . Be on top of his barking with your training and rewarding. Barking when the owners are out or away from the home. First, humans need to remember, we are the pack leader and we say who, we say what, and we say how. – if we are truly the pack leader we gently lead and set boundaries for our furry friend that will lessen behavior issues. So if your dog is barking when you are away from the home excessively ( doesn’t count for new puppies yet ), then you want to examine the amount of freedom of the home you give your dog. If he’s allowed to sleep on the furniture, counter surf, tear your favorite shoes, sleep on the kids furniture, pee in the house caused by improper house training or lack of house training, then chances are you may end up with stressed dog when you leave the pack. To try to fix this, you will not only need to set boundaries in the home for your furry friend, but you will need to work on creating security in your dog that you will come home. I firmly believe that when humans leave the home they should not touch, pet, talk, not even look at their dog during the EARLY training periods when you bring home your puppy and are area or crate training. Surely, a new dog or puppy will yelp and bark for your return. ( pulling at your heart strings and even bring tears to your eyes because all you want to do is turn around drown your puppy in reassurance ) STOP! Trust me when I say you’ll have a lifetime of hugs and reassurance to give, but right now, it’s important you set the stage for a happy, well adjusted, calm and secure friend. Reacting to his barking WILL only increase the barking and reward him for it. The puppy will soon learn that NOT reacting to the barking will NOT bring the owner back. Slowly over time, your puppy will be able to go into his area, or crate without a single YELP and simply lie down without a sound. You can give your puppy a pet on the head, a kiss, a cuddle and leave without the big scene. You return, he’s spread out as far as his crate will allow and you can open the door to the crate and he’ll even take his time coming out. Hugs, cuddles and praise. A GOOD well, adjusted happy dog!. They say that a dogs bark is worse then it’s bite – That statement can be true especially for your neighbors with dogs that are not well socialized, properly trained or by uncaring owners.